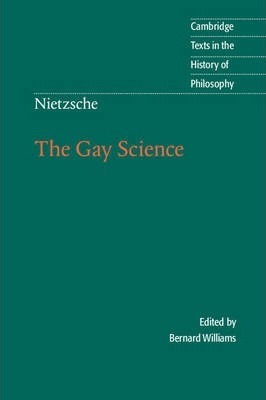 Nietzsche wrote The Gay Science, which he later described as 'perhaps my most personal book', when he was at the height of his intellectual powers, and the reader will find in it an extensive and sophisticated treatment of the philosophical themes and views which were most central to Nietzsche's own thought and which have been most influential on later thinkers. These include the death of God, the problem of nihilism, the role of truth, falsity and the will-to-truth in human life, the doctrine of the eternal recurrence, and the question of the proper attitude to adopt toward human suffering and toward human achievement. This volume presents the work in a new translation by Josefine Nauckhoff, with an introduction by Bernard Williams that elucidates the work's main themes and discusses their continuing philosophical importance. Joke, cunning and revenge: prelude in German rhymes; Book one; Book two; Book three; Book four: St Januarius; Book five: we fearless ones; Appendix: songs of Prince Vogelfrei. Bernard Williams is Deutsch Professor of Philosophy, University of California, Berkeley, and Fellow of All Souls College, Oxford. His many publications include Problems of the Self (Cambridge University Press, 1973), Moral Luck (Cambridge University Press, 1981), Ethics and the Limits of Philosophy (Harvard University Press, 1986), Shame and Necessity (University of California Press, 1993), and Making Sense of Humanity (Cambridge University Press, 1995).